Enjoy a half day of sightseeing tour which includes Trinity Cathedral Church and The National Museum where the replica of Lucy is on display. Then drive to Mt. Entoto for a breathtaking view of the city and drive to Merkato for shopping in the outdoor market. Includes both Addis Ababa Modern and Historic. 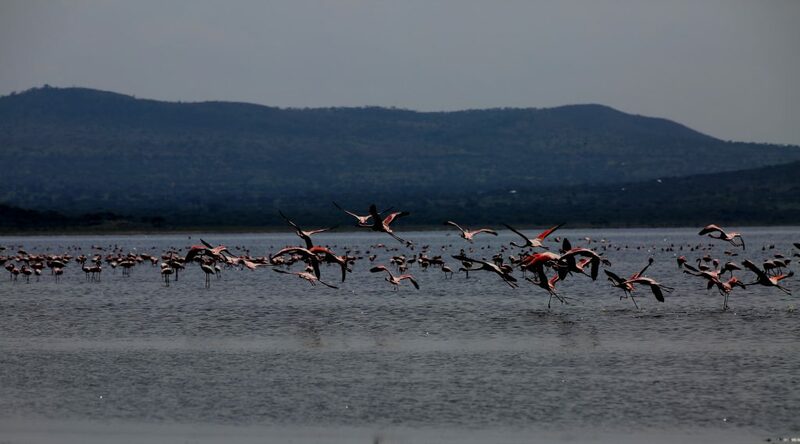 This day you will drive to Ziway south of Addis Ababa to the Northern most Rift Valley Lake of Ethiopia - Lake Ziway. After you arrive in Ziway you will drive rift valley wines farm place around 5 km from the city. The grape names that are produced in the rift valley are – merlot, Syrah, cabernet sauvignon, chardonnay, and others – are distinctly French, but the label on the Rift Valley wines is surprising: made in Ethiopia. The French beverage giant Castel, one of the world's biggest producers of wines and beers, is raising a glass to its first production of 1.2m bottles of Ethiopian Rift Valley wine. After your visit drive back to Addis. Early in the morning our diver guide will pick you up from your hotel. On the way to Wonche you will visit Gefersa Reservoir an artificial lake / dam on Gefersa River about 20 kms from center of Addis Ababa to the west. Wanchi Crater Lake is magnificent landscape, volcanic hot springs, surrounded by shady trees are really enjoyable. The scenic beauty with islands could be reached by boat. Nice waterfalls and the Alpine nature of the surrounding climate are worth seeing. Trekking and horse riding is possible here. In the late afternoon drive back to Addis Ababa and you will be transferred to your place, where the tour ends. Drive about 45 km to Southeast of Addis; you will visit the town of Debre Zeit, enjoying a warm climate at an altitude of 1900 meters. There are five crater lakes, each with its own distinctive water color. These crater lakes are full of bird life and excellent for walking. Drive North of Addis Ababa to the Blue Nile Gorge, which is comparable with the Grand Canyon of USA. 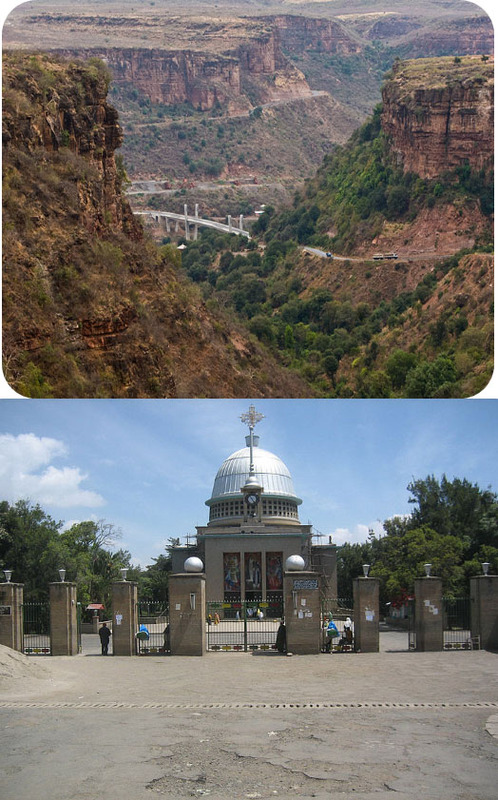 About 105 – km from Addis, the enchanting 13th century monastery of Debre Libanos overlooks the great gorge. Nearby an 18th century Portuguese Stone Bridge crosses a river high above a deep chasm below. About 90 km Southwest of Addis Ababa is the 12th century Adadi Mariam cave Church. This church is similar to the Lalbiela churches. DAY 1 — Drive southeast of Addis Ababa passing through Debre Zeit, Nazareth, Metehara, Lake Beseka and a few small towns along the main road. Then you reach Awash National Park. After lunch, observe Awash Falls, the gigantic gorge, and species of wild animals. Overnight stay will be in a hotel/lodge. DAY 2 — After breakfast, drive to the other side of the main road which leads to the Fantalle Crater and its surroundings. Then continue driving to the palm tree hot spring. Lunch en route. Return back to Addis Ababa late in the afternoon. In so many places all along the Great Rift Valley, the volcanic fires underneath the surface manifest themselves in various forms: as smoldering fumaroles, as crackling geysers, gushing hot water streams and as bubbling hot springs. Ethiopia’s potential for geothermal power generation and therapeutic facilities are known to be immense. However at present, the Langano Geothermal Project and the modest Sodore hot springs Resort are the only such developments to speak of. Most go to Sodore for its hot water treatment facilities and to swim in the Olympic-size pool. 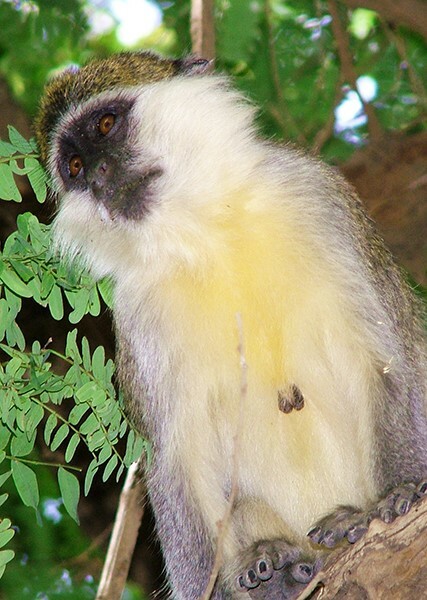 To others, its nature and wildlife (crocodiles, grivet monkeys and birds) along the Awash River banks are the main attraction here. Overnight own arrangement. Ambo is situated 125 km West of Addis Ababa. It is famous for its hot springs and mineral water factory. The spectacular falls of Guder River and the vineyards nearby gives the visitor a notable experience. Another 35 km drive through an extraordinary scenic landscape on the east of Ambo takes you to the crater lake of Wonchi. 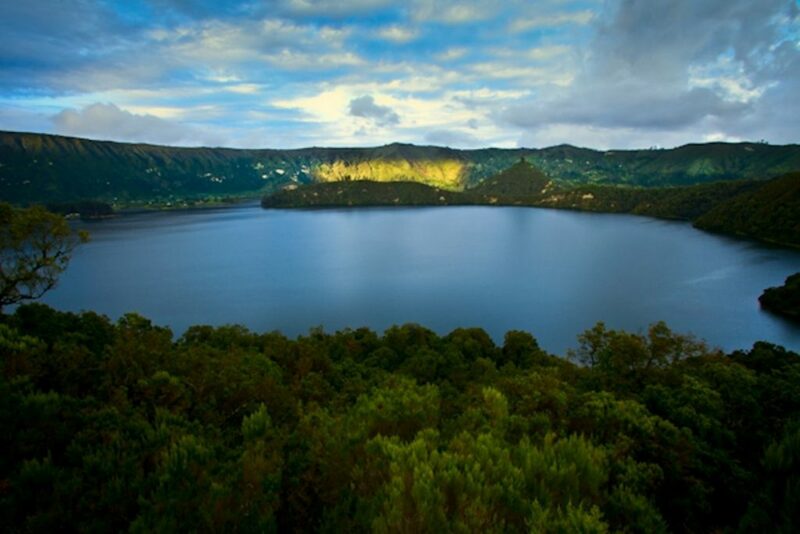 Drive South East of Addis Ababa through Debre Zeit and stop to visit some of the crater lakes. Proceed via Modjo, to Nazareth for a coffee break, and then you reach Sodere, a resort area, before lunch. Swim and relax by the bank of the Awash River. The place is known for its curative hot spring and thermal waters. Late in the afternoon drive back to Addis Ababa. DAY 1 Drive via Debre Zeit to the Great Rift Valley viewing villages and lakes Koka, Zeway, Abiyata and Shalla. Lunch at Lake Langano and continue driving to Wondo Genet located in a virgin forest with hot springs for an overnight stay at Hotel. DAY 2 - After breakfast drive to Awassa to see the fish market at Lake Awassa. Tabor Hill gives a panoramic view of Awassa and the surrounding area. Refresh along the lakeside and return back to Addis Ababa late in the afternoon. Early in the morning our driver will pick up you from your hotel and you will drive to north from Addis Ababa (about 100km) to the Debre Libanos Monastery. This monastery was founded in the 13th century by St. TekleHaimanot, who is, according to legend, prayed for 7 years straight standing on one leg until the other leg fell off. Nearby the monastery is the Portuguese bridge, which was the first bridge in Ethiopia. Around this area, you will hopefully see some endemic gelada baboons. Short hikes are available in the area, with stunning views of the Jemma Valley. Return to Addis Ababa, late afternoon.